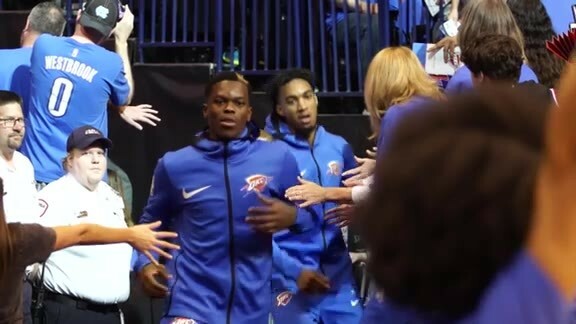 It was a nearly undetectable difference, but there was something extra in the gaits of Thunder players as they emerged from the halftime locker room. Down 13 at home to the LA Clippers, there was an urgency - not necessarily emotional, because the Thunder was playing hard - but more like an understanding of clear, purposeful intent. The whistle blew and then instinct completely took over. Defensively, the Thunder cut off driving lanes by being in the right position early. Paul George and Jerami Grant shut off lefty drives by Danilo Gallinari and Thunder guards kept their hands back on foul-baiting runners in the lane. The pace was furious on offense, with defensive rebounds or forced turnovers immediately flowing into transition opportunities at the rim. The result was a 39-10 quarter for the Thunder, the largest margin in a period in Thunder history. 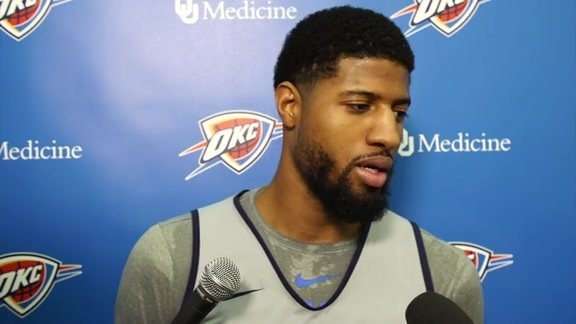 “It was Thunder basketball at its finest,” gushed George after the game on Fox Sports Oklahoma. “It’s something that we expect of ourselves to go out and defend home court,” added point guard Russell Westbrook, who scored 32 points to go with 8 assists, 4 rebounds and 3 steals. Westbrook’s fiery, relentless energy was the catalyst for the Thunder, part of a truly classic Chesapeake Energy Arena night in many regards. Westbrook’s brute force and tenacity resulted in countless bounding barrages into the paint. The constant pressure opened up opportunities for a varied offensive approach in the second half. Westbrook dished out 7 of his 8 assists in the second half, including a pair to Steven Adams in the fourth quarter that helped keep this one out of reach. George shined brightest in the fourth quarter, when he scored 11 points, knocking down all four of his field goals and all three free throws. By getting to his spot on the right elbow, using his body strength, height and length to snare the ball away from Clippers defensive ace Avery Bradley’s grasp, George got himself into his scoring zone. Despite a sweeping 20-0 run in the opening minutes of the third quarter, this was far from a simple win for the Thunder. In the first half, Donovan’s club got whistled for 18 fouls, putting the Clippers to the free throw line 24 times. In the third quarter, that latter number reduced to zero. The point of emphasis rules bogged this game down to a creep in the first half, and the difference from the free throw line and three-point line drive the difference at halftime. Major foul trouble stared the Thunder in the face after 24 minutes, with George, Jerami Grant and Alex Abrines each saddled with 3 fouls. The Spanish sharpshooter was in the midst of his best defensive game of his career, forcing three turnovers and blanketing Lou Williams on a pair of fallaway jump shots that clanged off iron. Those repeated stops helped generate a 9-0 Thunder run in the second quarter to tie the game, but over-aggressiveness with reach-ins exacerbated the problem, and the Clippers quickly regained a double-digit edge. After regrouping in the locker room, the Thunder’s renewed focus and expert-level execution of the defensive coverages flipped this game on its head. Rather than allowing middle drives, Westbrook, Terrance Ferguson and Dennis Schröder forced the ball past the slot, to the wing and into the corner, and that encouraged Thunder help defenders to slide over from the weakside for deflections. Disrupting the Clippers’ timing was all the Thunder needed to gain a rhythm of their own, and it led to 38 points off 25 Clippers turnovers and in turn 51.1 percent shooting overall for Oklahoma City, including a 9-for-17 mark from the three-point line. Even that momentum, however, was nearly derailed when a flagrant foul by Clippers guard Patrick Beverley nearly put this game back on a knife’s edge. With 6:20 to go, Beverley dove late and recklessly for a semi-loose ball near Westbrook’s feet. Instead of making a play on the ball, Beverley crashed into Westbrook’s right knee, causing a spooky tingle up the spines of Thunder faithful for the moment before a bit of chaos unraveled on the floor. After the dust up, which wasn’t much more than archery with words, Westbrook kept his cool and played with a firm, restrained command down the stretch. He found George at the elbow, send the ball into the post twice to Adams, who spun and scored then found a cutting Jerami Grant for a flush. “We can’t just be loaded and be a one-dimensional team. We have to have a one-two punch,” George noted. Then came the final fireworks, as the Ferguson, who played a tenacious 26 minutes, escaped from half court with a steal, then scooped up an alley-oop to Westbrook. The Thunder’s All-Star guard knew what to do with it, hammering home the dunk to put the kibosh on the 128-110 victory.